An energy company with a solid (and overlooked) niche and America's largest food company look too good for long-term investors to pass up. Time might be the most important advantage wielded by long-term investors, but only if it's used properly. While stock gains can compound to impressive levels over time, it's still important to buy great businesses at great prices. And sometimes great prices are only visible to those with a long-term mindset. For instance, at first glance, there's really nothing impressive about Antero Midstream Partners (NYSE:AM) outside of its 5.5% dividend yield. But dig a little deeper and you'll see that management expects growth projects already under way to deliver incredible distribution growth in the next five years: from $1.66 per unit today to $4.10 per unit in 2022. That would make the current stock price an absolute bargain. Meanwhile, there's a lot less mystery when it comes to Tyson Foods (NYSE:TSN). Shares have collapsed more than 20% since the beginning of the year following the impact from the trade spat between the United States and China. That has pushed the stock's dividend yield to all-time highs near 1.9%. But investors capable of focusing on the long-term opportunities ahead will find reasons for optimism. Here's why both of these cheap dividend stocks are worth a closer look. Antero Midstream Partners supports the natural gas production of its parent company, Antero Resources, in the Marcellus and Utica shale basins of Appalachia. The midstream operator is responsible for gathering, processing, and transporting natural gas from the field to processing facilities and beyond. It has developed a freshwater delivery business, too, which is now the largest in the region and expected to deliver one-third of total adjusted EBITDA in 2018. Location is key for the business's growth prospects. Today, the Appalachian region is responsible for nearly 41% of the country's total shale gas production, but that won't keep the Marcellus and Utica basins from doubling output by 2022. Antero Midstream Partners is all over the opportunity. The company has a five-year project backlog totaling $3.7 billion. That includes approximately $1.9 billion in gathering infrastructure to support natural gas production from Antero Resources, $800 million in expansion capital devoted to processing infrastructure for its 50-50 joint venture with MPLX, and another $1 billion in downstream opportunities including natural gas liquids pipelines and chemical processing facilities. Investing in growth is great. Investing in growth at just 4.3 times EBITDA multiples is nearly unheard of in the midstream business. That's what gives Antero Midstream Partners confidence it can increase its distribution to $4.10 per unit in 2022, which represents a dividend yield of 13% at the current stock price. Considering that will be driven by growth in projects with visible earnings and cash flow, investors shouldn't overlook the opportunity presented by the high-yield oil stock, which might not be obvious looking at valuation metrics based on the last or next 12 months only. Tyson Foods stock has been hammered more than 20% in 2018. Whether semantics draws the line at "war" or not, trade tensions between the United States and China have spilled into a larger economic conflict, and American meat exports have been one of the biggest casualties. That forced the food producer to reduce its full-year 2018 guidance for adjusted earnings to a midpoint of $5.85 per share, compared to the original midpoint of $6.63 per share. However, it's important to note that food exports (and operations in China specifically) were never a big mover for Tyson Foods. Rather, the business is suffering indirectly, as less exporting of American meat products has increased domestic supply and reduced domestic prices, dragging down the entire industry. But it should only be temporary. Moreover, the business has invested heavily to diversify revenue streams away from commodity-based food production and into higher-margin markets including packaged foods, branded proteins, food services, and even next-generation clean-meat start-ups. Those efforts have already begun to pay off and make the recent stock plunge even more appetizing for long-term investors. Despite weaker margins for domestic producers, Tyson Foods was able to grow fiscal third-quarter 2018 adjusted operating income 8% compared to the year-ago period. Total revenue grew just 2% in that span. Similarly, the business grew operating cash flow 33% in the first nine months of its fiscal 2018 compared to the same period of 2017. One huge reason: the high-margin prepared-foods segment grew revenue 17% in the comparison periods, with the benefit nearly evenly split between increased volume and increased pricing. Long story short, while Wall Street is freaking out, management is keeping its head down and executing on the long-term strategy. It's even adapting on the fly, as evidenced by the $2.16 billion acquisition of Keystone Foods in late August, which will provide robust operations in the United States and abroad (getting around tariffs) and boost annual revenue $2.5 billion. Take that, uncertainty. 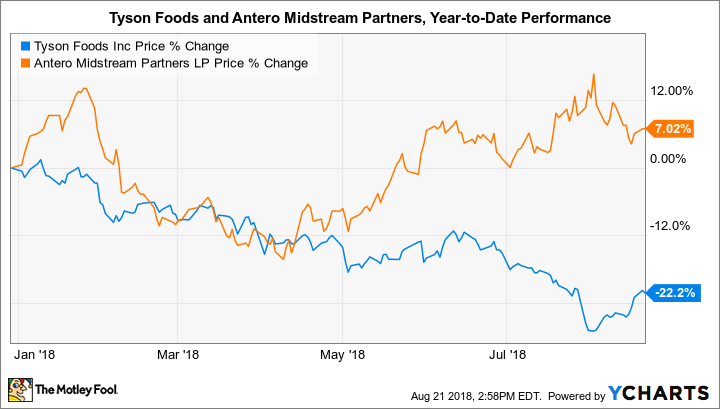 Antero Midstream Partners and Tyson Foods present a great opportunity to investors with a long-term mindset. The former is sitting on a gold mine and has quietly become one of the most important companies for American energy growth in the Northeast. The latter is suffering from decreased selling prices due to a temporary buildup of meat supply in the United States, but Wall Street doesn't appear to be properly accounting for the company's diverse growth opportunities. Luckily, long-term investors can buy these cheap dividend stocks today before the broader market catches on to the bargains sitting in plain sight.